The Ontario government announced late in the day last Friday it had given Renewable Energy Approval (REA) to the 100-megawatt “Nation Rise” wind power project, proposed by Portugal-based EDP Renewables. The project is proposed for North Stormont, between Ottawa and Cornwall. Many comments were received by the government during the comment period for the power project, many of which related to the unusual geology of the area. Ontario has already seen the results of wind turbine construction over fragile hydrogeology (though denied by the government), in Chatham-Kent where water wells have been disturbed such that at least 20 families do not now have water from their own wells. Several parties are now calling for a public health investigation. One would think that, given the seriousness of these concerns, and irreversibility of any damage to the aquifer, the Ministry would have required these reports before issuing an approval. Residents have other concerns including effects of being exposed from the noise emissions from that many wind turbines which will also be among the most powerful in the province. That concern is magnified by the fact that this new wind power project did not have to abide by Ontario’s newest set of rules for wind power generators, but was able to opt for the less strict, older guidelines. It is possible that many turbines will be out of compliance with new regulations the minute they begin operation. If the project goes ahead. The community is now pondering next steps, which could include an appeal of the approval. Federal Conservative government did a study on this situation in 2015 because I guess it’s called caring and oversight. I bet no one in either current governments care. I could write a book a these dangerous and uncaring precedent by our current governments. This dates back 15 years and some of our Municipal Governments show the same uncaring and wreckless decisions on so called “Green Energy” I would have put up 5 in two locations away from people and the studied the hell out of them, but no Our geniuses at QP had to put them up anywhere next to people and on prime soil. How the hell are people going to live without water and food. Now we will have to live on electrons and marijuana.. Real. Caring Politicians do Due Diligence. Do you want more because I can give you more. I am requesting a reply to this dangerous Situation that you have put upon the people outside Toronto. Again you just do not give a damn. It’s time that you do. The medical dangers of all hydro dates back to the early 1030s, but the current governments don’t really care. Do you get my theme in my remarks? Sooner or later we will hold “ALL” politicians accountable. I hope that you all carry Liability Insurance especially Cabinet ministers. Again please reply. May God Bless Ontarians, because Our Governments are destroying our health,.Maybe we can sue Toronto since it seems to lack The Green Energy Useless Giants. I have not done much research on Solar Panels but I am eyeing their use and I laugh at where some are used. I’m going to say do not put them anywhere near food. My words are the tip of the iceberg.There is also stray, voltage and dirty electricity and how they kill animals Looking forward to a Reply! My study is like watching Tragic Cartoons and I am not laughing. Thank You. You are 100 % right. Your posting sounds as one I have written. It states exactly what I have been saying for the past ten years. Turbines were built at my home in Clear Creek Ontario 2008. I continue to live he hell caused by living too close to industrial wind turbines. Medical treatment I have received so far has cost our health care system thousands of dollars. Pain and suffering, loss of home, inability to work, humiliation experienced by others who look at me as if I’m crazy.. Ignorance and laziness by our Liberal government – this well extends to the people of Ontario as well. People don’t care about others being harmed, as long as it’s not them being effected. “Study the hell out of turbines” – the studies are there, dating back 50 years, peer review published research, real science about the effects of infrasound /low frequency noise on humans. “Government oversight” – the oversight is deliberate. The government knows the facts. They have proceeded recklessly, regardless. Negligence causing death – insurance to cover this? Hefty fines and jail time for these criminals at the least. How about an eye for an eye..
Dalton McGuinty:s Green Energy Act is the biggest SCAM in the history of Ontario. Well put Frank and Tracy but you know that has all been repeated many times during the last fifteen years. Now I will add an insult to our injuries. This past Monday I had an opportunity to visually inspect the hydro electric power dams on the Madawaska river system. They all were spilling water because the power is simply not needed. This morning, May 11, 2018 the Ontario grid demand is slightly over 15,000 MW. This day 15 years ago the Ontario grid demand was expected to top out at close to 30,000 MW. The Green Energy Act has forced manufacturing to leave Ontario. Along with the businesses go the people. Along with the people go their energy demands. This has all been well documented and the Liberal government continues to claim that Ontario is doing fine. I have not yet met any person with a permanent job in the windmill industry, although there must be some. If Ontario keeps losing industry the only employer will be government but the power demands will also be lower. It is possible to divert that water that is being spilled. Pass it through the turbines and tell everyone to use up all the electrical energy they want. Sort of the more you help use up the less you pay. To my knowledge there is no Industrial Wind Turbine that has, as yet, produced more energy than was required to build, install and maintain that unit. As they age the overall production minus maintenance curve nosedives. The completely intermittent and unreliable output makes the IWT’S a total headache for the grid controllers. I cannot conceive any reason to need more! 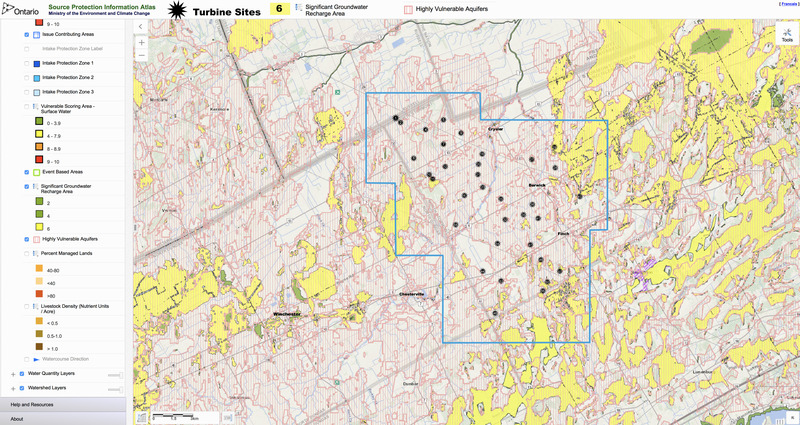 The aquifer is vulnerable where ever a turbine is located.